Interested in history and architecture? Opt to visit the Santa Catalina Monastery, offering a brief respite from the outside world and a unique view into a bygone way of life. For spicy food lovers, checking out one of the “Picanterías” is a must. Arequipa holds a variety of regional food — alpaca, shrimp, pork, lots of soups, and spicy sauces, waiting for you to dig in. Only ground transport Public bus, plane, train, boat, hiking. 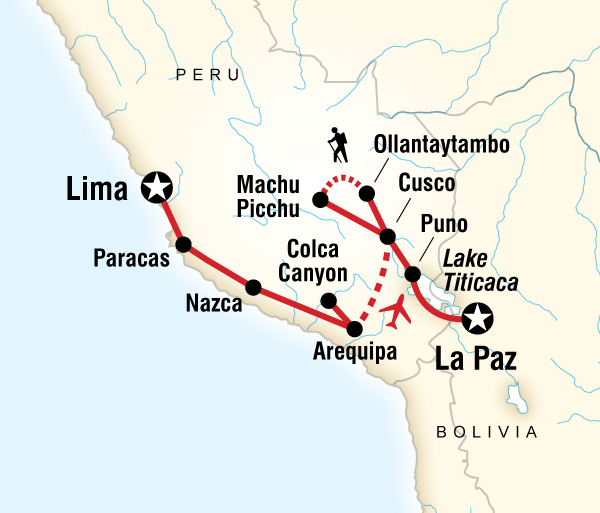 Guides Chief Experience Officer (CEO) throughout, specialist Inca Trail CEO on hike. 1. INCA TRAIL AND MACHU PICCHU REGULATIONS The rules and regulations controlling the Inca Trail and Machu Picchu are continually changing. Before embarking on your adventure to Peru it is very important that you familiarize yourself with the Inca Trail booking policies and guidelines as described in a document available on our website, at the following URL address: http://www.gadventures.com//terms-conditions/inca-trail-booking-policies/ 2. MACHU PICCHU BY TRAIN - OPTIONAL Please advise at time of booking if you do not wish to hike the Inca Trail. Instead, you will have 2 nights in Cusco, travel by train for a night in Aguas Calientes, and join the hikers for the tour of Machu Picchu. 3. INCA TRAIL MAINTENANCE Portions of the Inca Trail will be closed for general maintenance during the month of February each year. Also, closures may occur at various times throughout the year due to inclement weather or other conditions beyond our control. During these periods, any tour affected will hike the Lares Trek. 4. COMBO TRIP Please note that this tour combines with other G Adventures tours. As such, the staff and some travel companions on your tour may have previously been traveling together with G Adventures, prior to Day 1 of your tour. Likewise, some staff and travel companions may be continuing together on another G Adventures tour, after your trip concludes. 5. YELLOW FEVER It may be required to show a Yellow Fever certificate upon entering the country visited. Please check in with your local health expert for advice on Yellow Fever and other inoculations required for this area. 6. 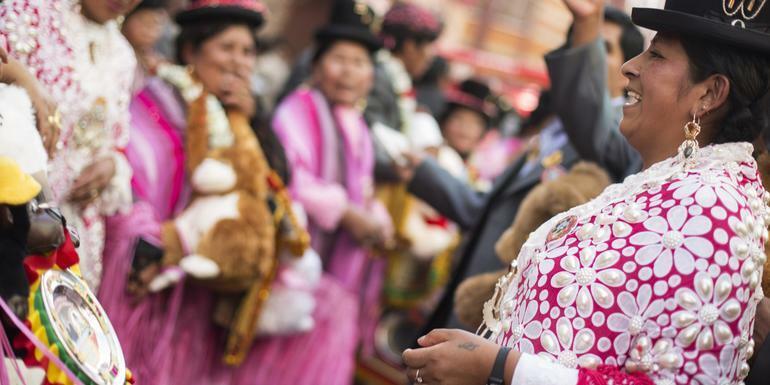 In our continued effort to support the rights of the porters on the Inca Trail, we would like ensure that they never exceed the weight limit for their packs as set out by the Peruvian authorities. Porters are allowed to carry no more than 6kg of personal belongings per hiker (for all other Peru treks the limit is 8kg). That means that including your sleeping bag, toiletries, clothing, etc, you are allowed a total weight of 6kg for the hike which will be carried in a duffle bag provided by our local office. Any additional weight must then be carried by you in your day pack. To help achieve this goal we recommend that you carry travel sized toiletries, that you bring sport sandals that can be worn with socks (which are lighter than running/walking shoes) and that you limit electronics to those that you are willing to carry. Any additional baggage can be left in Cusco, but is advised that you bring anything of value (eg. money, passport, credit cards, camera, etc) with you on the trek. If at the end of your trek you felt your trekking guide and support team did an outstanding job, tipping is appreciated. The amount is entirely a personal preference, however as a guideline, we suggest each hiker contributes the following to a collective pool. We suggest a tipping amount of $40 per person for the Inca Trail and $35 per person for the Lares Trek. 7. All travellers are required to pay the tax on domestic flights in Peru. Foreign travellers are exempt form this, and proving you are indeed a foreign traveller can be done by providing us with your international ticket number (ITN). Travellers who do not submit international ticket numbers at least 30 days prior to Day 1 of their tour will be required to pay the domestic tax on all included flights. 8. YELLOW FEVER It may be required to show a Yellow Fever certificate upon entering the country visited. Please check in with your local health expert for advice on Yellow Fever and other inoculations required for this area. 9. WET SEASON Please be advised during the wet season (Jan - April) if there are periods of severe rain some of the campsites on the Inca Trail may become unusable. In the interest of your safety, there may be changes made locally to the trekking itinerary if the conditions of the campsites are assessed to be unsafe. 10. GROUP DYNAMICS Please note, in most cases, the entire group will not be hiking the Inca Trail together. Members of the group may choose to hike the Lares Trek or spend additional time in Cusco and the Sacred Valley instead of hiking. If you have chosen the Lares Trek or Cusco Stay you may be paired with members of other G Adventures groups for the trek, transportation, and activities included.